Chain link fence is widely used for many applications because of its durability, versatility and because it is economical. A chain link fence can serve many purposes. A fence can serve as a barrier to protect your equipment, inventory, or property, it can provide a safe environment for employees, it could contain animals or children in the backyard, or it may just form a dividing barrier to keep the peace. Whatever the application, there is more to it than "just a fence". If you were shopping for a car, wouldn't you want to find a vehicle that is going to last? You would look for something that will serve your specific purpose, the engine and transmission would need to be durable, and it would need to look nice. There are a lot of choices out there and you don't want to buy something that is more than you need, but more importantly, you don't want to buy the cheapest one out there that may not last very long because that would obviously cause you to be shopping for a new vehicle again sooner. It is much the same when shopping for a fence. There are many different sizes and thicknesses of steel for the posts and framework, there are different steel alloys that can be chosen for the heavier commercial/industrial fences, there are a number of different fence fabric diamond sizes, wire gauges, galvanized or aluminized coatings for the wire, color coatings, not to mention proper techniques that need to be employed for installing the fence. If you ask three different contractors for just a fence, you may just get three different opinions. They might be quality opinions, or they could be just trying to use the least expensive materials they could find so they can win the job by being the low bidder. Like many things, you get what you pay for. It makes a lot of sense to discuss the fence specifications that you are being quoted and not to assume that all quotes will be the same. Below I have included a few charts with some descriptions of different types of fence framework and fence fabrics that we consistently use for your reference. Fence pipe is measured on the outside diameter (O.D.) and is available in the following sizes for commercial/industrial fence: 1-5/8", 1-7/8" (also known as (aka) 2"), 2-3/8" (aka 2-1/2"), 2-7/8" (aka 3"), 4", 6-5/8", and 8-5/8". WT 30 = next most strong type of pipe generally used for fence framework. This is constructed from the same alloy as the SS/WT 40, but it is slightly thinner and consequently lighter per foot. This meets ASTM F 1043 for strength and coatings and the same as the SS/WT 40, it would exceed F1083 if it were heavier and had more galvanizing. Schedule 40(F1083) = Could quite possibly be the fence framework used on the very first chain link fence job in history long ago, commercial or residential. This is still widely specified today, possibly only because it has always been what has been specified and it has worked for many years. This product is thicker and heavier than the SS/WT products, but due to the softer steel that it is made up from, it actually does not have the same strength as the two products above. In addition, the schedule 40 product tends to be more expensive than the SS/WT products as well. WT 20 = This is usually considered to be a "medium duty" fence framework. Again this type of pipe is a very strong material that is made from the same alloy as it s two "big brothers", but it is rolled from thinner materials and is lighter per foot. Fence pipe is measured on the outside diameter (O.D.) and is available in the following sizes for residential fence: 1-3/8", 1-5/8", 1-7/8" (also known as (aka) 2"), 2-3/8" (aka 2-1/2"). 16 gauge = This is more frequently used as an upgrade to a residential fence, used with a black polyester powder coated fence "system", or just as "insurance" when a larger residential gate is installed. 17 gauge = This is the most common thickness of framework used for residential fence systems. There are lighter gauges available, but you won't find us using them because they are too light and damage too easily. Chain link fence (aka)"mesh"; "fabric"; "wire"
Chain link fence fabric comes in many different diamond sizes, wire gauges, and coatings. The most common "diamond" size we use for commercial fabric is 2", while the most common size for residential is 2-1/4". There are also 1", 1-1/4", and 1-3/4" diamonds that are fairly commonly used for various applications, as well as custom ordered diamond sizes. The wire gauge for commercial grade is generally 9 gauge, but we also use a heavy 6 gauge wire in some applications where the fence needs to hold up to a lot of abuse, like behind home plate on a backstop. For residential fence we use 11-1/2 gauge which is fairly standard in the industry. As for the coatings, there are different ways that fence fabric is coated, but we use three main types. Hot dipped galvanized, the mesh is dipped through a tank of hot zinc galvanizing after the mesh had already been woven together; aluminized, which is the process of extruding a protective aluminum coating over the top of a steel wire prior to weaving it into the mesh; and vinyl coated (more on this later). A common commercial grade fence fabric would be described like so; "6', 2" x 9 gauge galvanized KT". This would translate 6' high, 2" diamond (measured diagonally between the wires), 9 gauge wire diameter, hot dipped galvanized, with a knuckled over selvage, or end, on one side and a twisted and barbed selvage on the other (top or bottom of the fence). 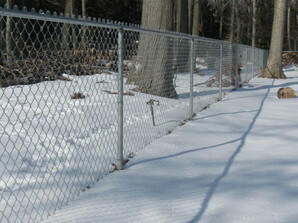 A common residential grade fence fabric would be 4', 2-1/4" x 11-1/2 gauge galvanized KK. Which would be 4' high, 2-1/4" diamond, 11-1/2 gauge, galvanized with knuckled selvages top and bottom. A black vinyl coated chain link fence is great because you get both versatility and great looks. The problem is it can be difficult to get an "apples to apples" comparison, unless you have a better understanding of what you are asking for. When dealing with black vinyl coated chain link fence the height and the diamond size are called out the same as you would on any other galvanized fence. The confusion comes in with the vinyl coating and the wire diameter. There are two main types of vinyl coatings that we use. The first is called extruded, which is a thicker powder coating that finishes off almost like a "sleeve" of vinyl over a core wire, but it is not adhered to the wire itself. The second is called fused and bonded, which utilizes a thinner powder coating extrusion, but there is a bonding agent used on the wire inside which "fuses" the wire and the powder coating together. Fused and bonded tends to be a more durable product, the vinyl doesn't look as heavy or bulky, but is often more expensive. With respect to the wire diameter size, it is called out by the outside diameter of the vinyl coating itself. This means that the outside diameter size includes the thickness of the vinyl as well as the size of the core wire, ie:the wire that is inside the vinyl coating. Now, because the vinyl coatings are different thickness over the top of different sized core wires, you will begin to see confusion. For example, a 2" x 8 gauge finish extruded black vinyl coated fence fabric is considered a residential fence fabric because the inside diameter of the core wire is 11 gauge with the balance of the diameter made up with the vinyl coating. Conversely, if you have a 2" x 8 gauge finish fused and bonded black vinyl coated chain link fence, because the vinyl coating is thinner, the core wire must be larger, so in this case it is a 9 gauge core wire, which makes this a commercial grade fence fabric. Hopefully this clears up some of the confusion about vinyl coated chain link and how important it is to clarify what the inner core wire's diameter is, because after all, the core wire is where the strength of the fence is, not the vinyl coating wrapped around it.